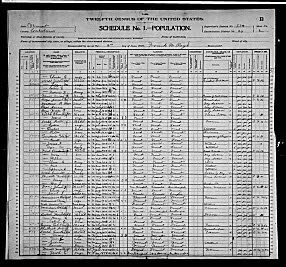 Without fanfare FamilySearch.org recently released images for the 1910 and 1920 censuses. To see either the images or the links, you must first login. 1850 X Free for everyone. 1860 X For a fee on Fold3. 1870 X Free for everyone. 1900 X Free for everyone. 1910 X Free for some. Or for a fee on Ancestry.com. 1920 X Free for some. Fanfare or not, I’ll take what I can get. Actually, the census images are not viewable to all active indexers and are currently restricted only to members of the LDS church. Non-LDS active indexers cannot currently view the images. Even when non-LDS active indexers are logged in to FamilySearch, it will state that "Licensing prohibits display of image on FamilySearch." in the record screen. There is also a link to view the image on Ancestry.com on the left side of the screen if one has a subscription there. However when I asked support about this, FamilySearch stated that the census record images would be freely accessible to active indexers in the future. As for the 1880 census, it was indexed in the old extraction program that was used years before FamilySearch Indexing was developed, and thus cannot be connected to the corresponding images without significant technical work. The 1930 census is not yet completed (records for Puerto Rico are still being indexing now), so that is probably the reason why this collection lacks images.